The family-run Aquarius Studios are located on the coastal road of Anaxos in Lesvos, within 50 metres from the beach and a short walk from restaurants and shops. It offers self-catering units with a balcony overlooking the garden. Located in Naxos Town and just 200 metres from Agios Georgios Beach, Mama's Rooms offers studios with free Wi-Fi and views over the Aegean Sea. Free 2-way transfer from the airport or port can be provided. 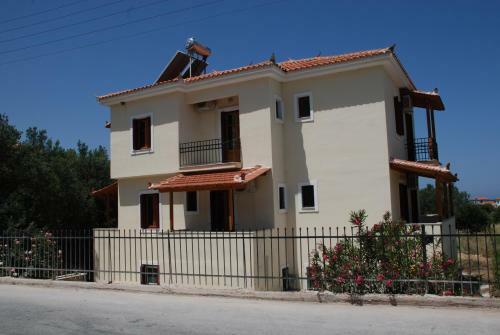 Klimataria is located on the beach of Anaxos and 200 metres from the town centre. It features a restaurant and rooms with a balcony overlooking the garden. Each room includes a fridge and a bathroom with shower. Stratis is 100 metres from the beach of Anaxos and its town centre, where restaurants and cafeterias are located. 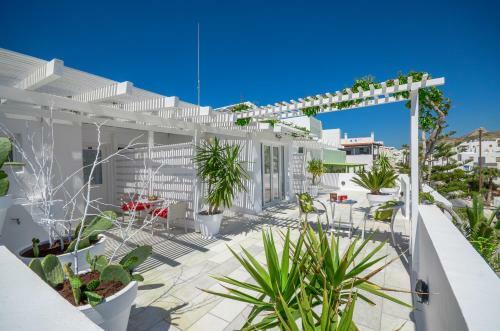 It features a sun terrace and studios with a balcony overlooking the garden. 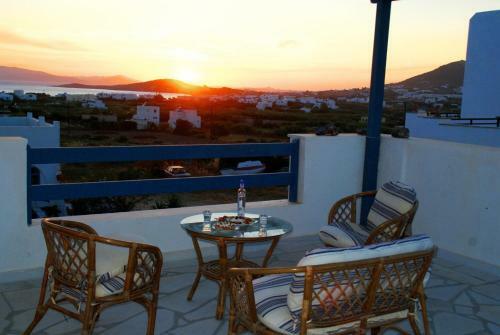 Quietly located in Aggidia area of Naxos, Aeolos Sunny Villas is set amidst a blossomed garden. 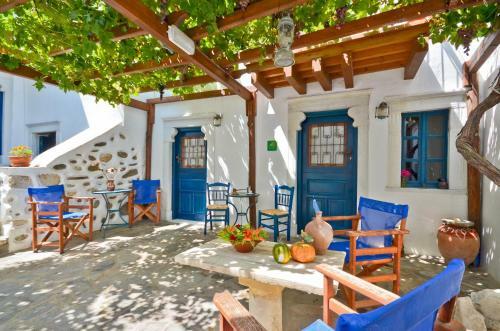 It offers self-catering accommodation opening to a terrace or balcony with Aegean Sea or mountain views. Free Wi-Fi is provided in all areas. The Cycladic-style Dolphin Studios is located in Agia Anna of Naxos, within 100 metres from the long sandy beach and just 50 metres from restaurants and bars. It offers self-catering units with garden-view balconies. Located 200 metres from the beach and restaurants of Anaxos in Lesvos, Mary's Apartments features studios with a balcony. 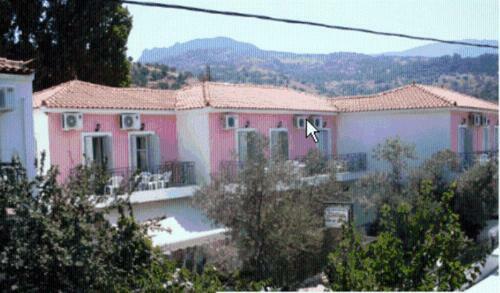 The property is 9 km from the beach and hot springs of Eftalou village. Located on the beach of Agia Anna in Naxos, Paradiso Studio & Apartments on Naxos Island offers self-catering accommodation with a balcony. It features a sun terrace, garden and restaurant on site. 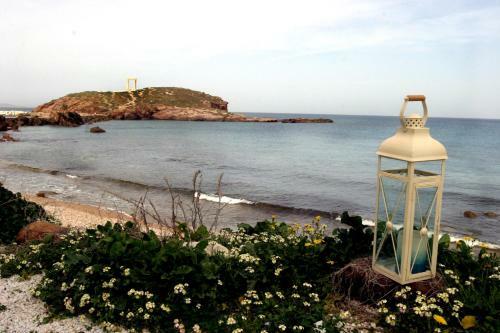 The Cycladic-style Surfer Paradise lies within 500 metres from Agios Georgios Beach in Naxos. It offers self-catering accommodation with free WiFi and a furnished balcony. Naxos Town is 1 km away. 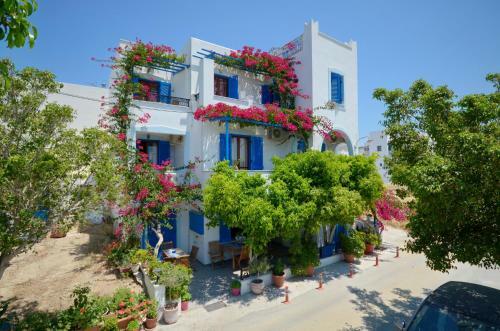 Located 50 metres from the famous Plaka Beach in Naxos, Sea Melody Studios features self-catering accommodation amidst its well-tended gardens. The property enjoys panoramic views of the Aegean Sea and offers free private parking. Just 150 metres from Agios Georgios Beach, Pension Dimitra offers free Wi-Fi access and air-conditioned rooms with a balcony. Complimentary transfers to and from the airport and port are available upon request. Quietly located 150 metres away from the sandy beach of Agia Anna, Sophi�s Studios & Apartments is a typical Cycladic-style complex offering self-catering accommodation with a private, furnished terrace or balcony. Only 50 metres from Grotta Beach and 300 metres from Naxos Port, Magic View offers tastefully decorated accommodation equipped with air conditioning and a shared or private balcony. Wi-Fi is free throughout the property. Vassilis Studios is situated in a lush garden of vegetables and fruit trees, 300 metres from the beach of Anaxos in Lesvos. It offers free Wi-Fi and self-catered accommodation with balcony or patio overlooking the garden or surrounding area. 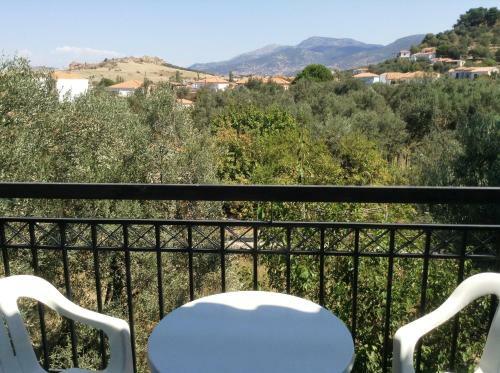 Just 50 metres from Agios Georgios Beach, Nufaro Studios boasts free Wi-Fi access and studios with a furnished balcony looking out onto the garden. Restaurants and a minimarket are 10 metres away. Just 50 metres from Agios Georgios Beach, the family-run Euro Studios offers self-catered accommodation. Built according to local architecture, it provides free 2-way transfer from Naxos Airport and Port. Located near the beach of Anaxos, Armonia Studios is set amidst lush gardens and features a swimming pool with a poolside bar. It offers air-conditioned accommodation with views over the village and the Aegean Sea. Only 150 metres from Agios Georgios beach, Marileta Apartments is steps away from the centre of Naxos Town. The air-conditioned studios and apartments offer a balcony with street views and free WiFi. 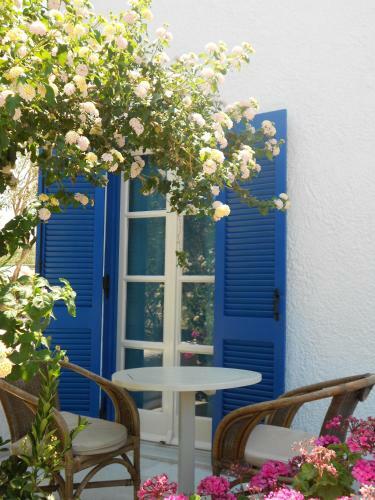 Centrally located in Naxos near the Venetian Castle, Studio Irene is just 30 metres from Agios Georgios Beach. It offers air-conditioned studios with balcony and views to the town. 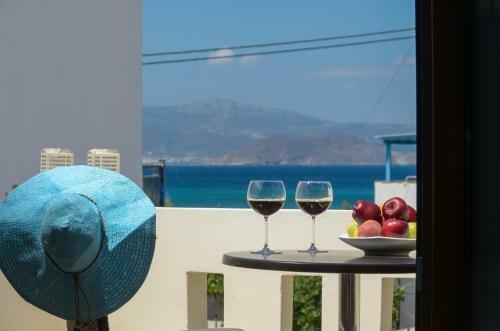 Situated 50 metres from Anaxos Beach, Garden View Apartments features accommodation with a furnished balcony overlooking the Aegean Sea or the garden. The Cycladic-style Naxos Golden Beach features self-catering accommodation with free Wi-Fi just 10 metres from Agios Georgios Beach in Naxos. 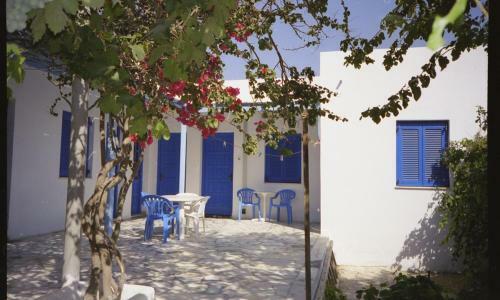 The family-run guest house offers free transfer from and to Naxos Port or Airport upon request. Built-in traditional Cycladic style, Galanos Studios is 100 metres from Lagouna Beach. Air-conditioned studios overlook the garden or Aegean Sea. 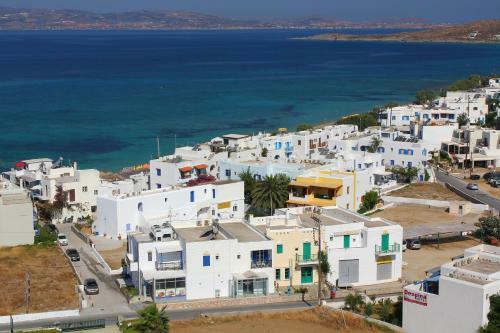 Naxos Town, boasting restaurants, caf�-bars and shops, is 800 metres away. Located right on the sandy Agia Anna Beach in Naxos and within 6 km from Naxos Port, Step by Step features a sea-view breakfast room. It offers self-catered accommodation with free Wi-Fi and furnished balcony overlooking the Aegean Sea. 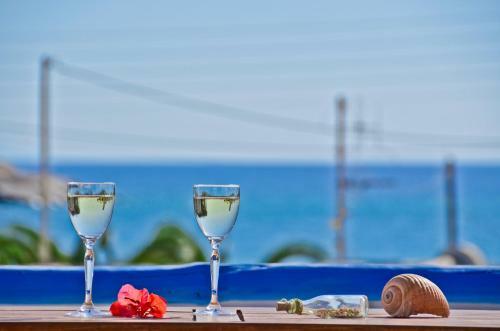 Situated right across the sandy beach of Agia Anna, the whitewashed Plaza Studios offers self-catering accommodation with a furnished balcony enjoying Aegean Sea views. Free Wi-Fi is provided throughout the property. Just 7 metres from the sandy Kastraki Beach, the Cycladic-style Akti Kastraki Areti Bungalows are set within a 2,500 m2 garden with stone-paved pathways and olive trees. Just 10 metres from the sandy Agia Anna Beach, Magic View II Agia Anna offers tastefully decorated accommodation with kitchenette and a private balcony. Within a short walk, you can find many beach bars, restaurants and a mini market. 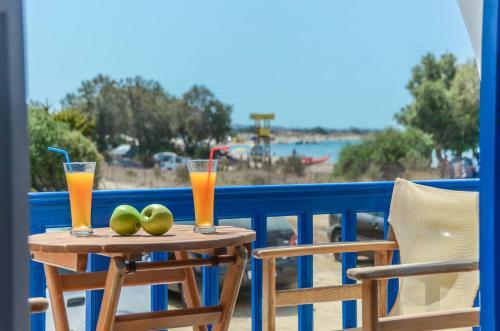 Situated right across from the beach of Agia Anna in Naxos, Margaritis Apartments offers air-conditioned units with a balcony overlooking the Aegean Sea. Guests have access to free private parking and an on-site supermarket. Just a few metres from the sandy beach of Agia Anna in Naxos, Litsa Studios offers self-catered accommodation with a TV. Several tavernas, restaurants and beach bars are 10 metres away. Vasilikos Studios is centrally located in Naxos Town, just 50 metres from the sandy beach of Agios Georgios. It features self-catered rooms with free Wi-Fi and air conditioning. The hotel can arrange relaxing massages. Al Mare is located just 50 metres from the centre of Naxos town and only 10 meters from the sandy beach of Saint George. Situated just 200 metres from the sandy Saint George Beach, Maria Studios is a traditional Cycladic complex. It offers air-conditioned rooms with balconies and free Wi-Fi access. 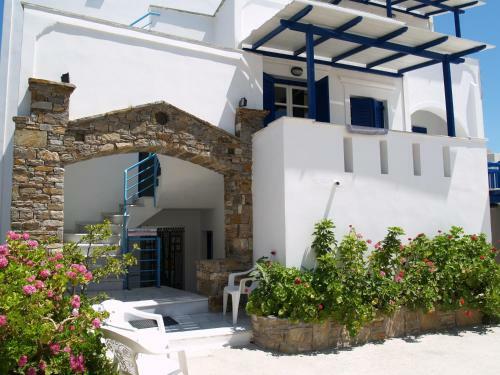 Mavrommatis Studios is located only 200 metres from the popular Agios Georgios beach in Naxos. It offers very spacious, self catering studios and easy access to local amenities. The Cycladic-style studios have air conditioning, fridge and balconies. Aspasia offers accommodation with kitchenette, and free Wi-Fi in its public areas. It is just 40 metres away from the sandy beach of Agia Anna featuring many seaside cafes and taverns. 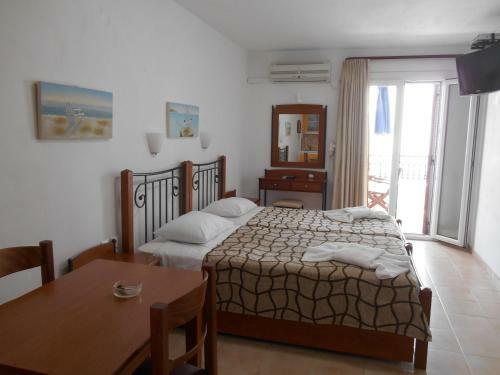 Jason Studios is situated only 50 meters from the famous beach of Agios Georgios, with its many restaurants and bars. The hotel swimming pool offers a sun-lounger terrace where you can enjoy a drink or coffee. Antonio Studios is located a few steps away from Naxos Town� main square and only 3 minutes� walk from Saint George Beach. Parking and Wi-Fi are both free. It offers self-catering studios, ideal for couples and families. Situated just 250 metres away from Agia Anna Beach, the air-conditioned Sofia Studios on Naxos Island each feature a private balcony with wide views of the Aegean Sea. 9 Muses Naxos is a newly built apartment complex in Kastraki. 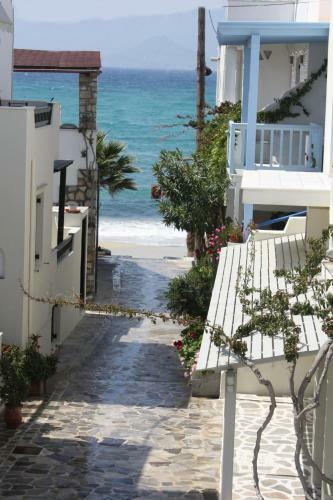 It is 14 km from Chora of Naxos and 80 meters from sandy beaches. There are 1 and 2 bedroom apartments with a living room that includes a bed-couch for 2 persons. Situated near the Medieval Castle of Naxos, Studios Bourgos I offers rooms with kitchenette and free Wi-Fi access. 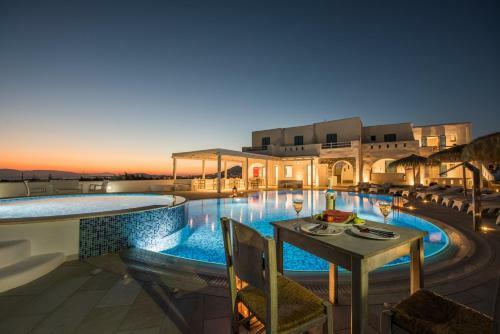 It has a rooftop terrace overlooking the Aegean Sea and Naxos town. Athina Apartments, offering free wireless internet, enjoy a great location only 50 metres from the famous St. George beach, in the capital of Naxos. The complex offers comfortable and well equipped studios featuring a kitchenette, and refrigerator. Situated only 50 metres away from Agia Anna Beach, Polemis Studios & Apartments is within walking distance of many seaside bars and restaurants. It offers rooms with kitchenette, and free Wi-Fi throughout the property. 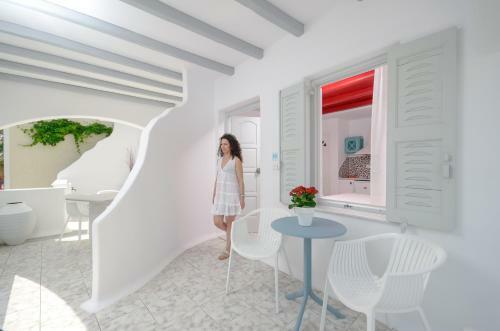 Kapetanos Rooms is located in a whitewashed Cycladic-style building in the centre of Naxos Town, just 70 metres from Agios Georgios Beach. It offers air-conditioned rooms with a furnished balcony. The traditionally built Sea View Studios offer self-catering accommodation in the quiet resort of Agia Anna. 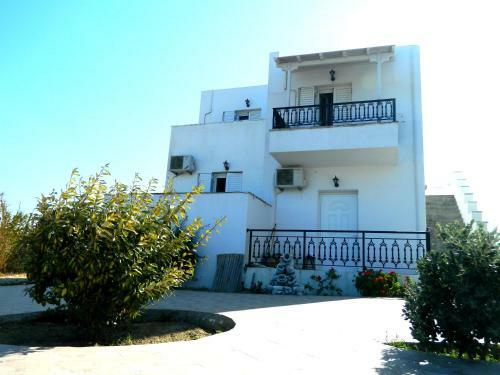 They are located 20 metres from the sandy beach and 6 kilometres from Naxos Town. Katerina Studios offers self-catered accommodation, within a short walk from Agios Georgios Beach. Featuring a blossomed garden, it enjoys a quite location, yet with easy access to the port and the lively centre. 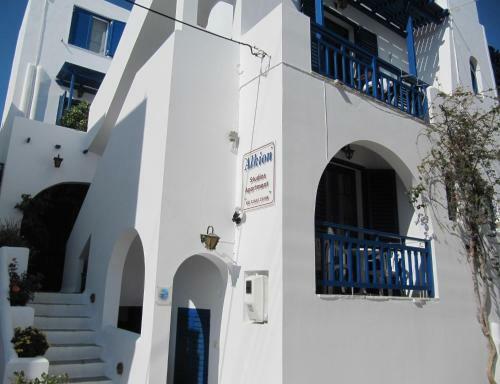 Iades Studios is located in Naxos's Agia Anna neighbourhood, only 50 metres from the beach. The self-catered Iades Studios come with private balconies. Each of the traditionally furnished studios features a kitchenette with coffee maker and fridge. In Naxos Old Town by the Venetian Castle, Studios Bourgos II features self-catered rooms with free Wi-Fi and a furnished balcony. Free transfer to and from Naxos Port is offered. 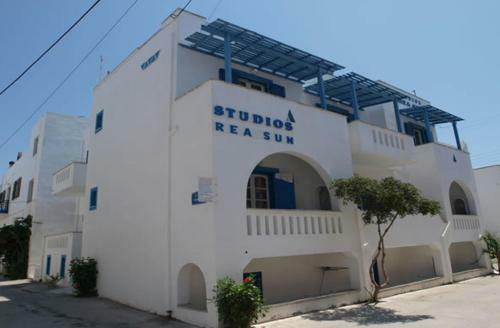 Just 500 metres from the blue-flag Agios Georgios Beach, the family-run Sunlight Studios offers air-conditioned studios with kitchenette and private balcony. Guests can enjoy a Continental breakfast by the poolside. 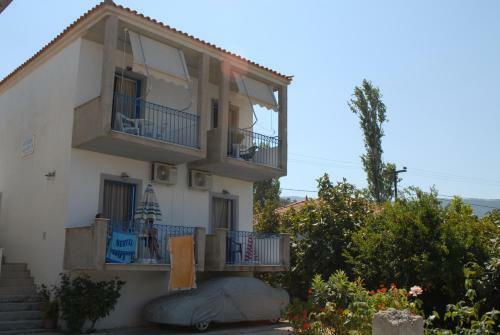 Agia Anna Studios is 100-metres from the famous sandy beach Agia Anna, offering free sun beds. It offers rooms with private balcony, free WiFi and air conditioning. Daily maid service and free private parking are provided. 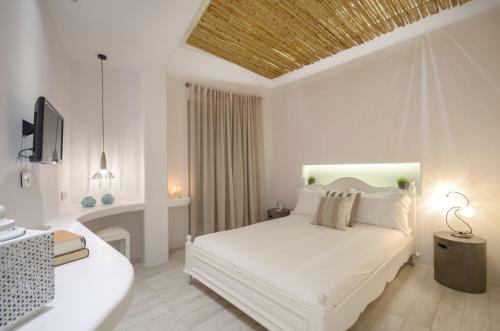 Just 50 metres from Agia Anna Beach in Naxos, whitewashed Irini Studios offer Cycladic-style rooms with a furnished balcony overlooking the garden. The self-catered units feature free Wi-Fi. Naxos Sun studios are situated in the area of Koti, 800 meters from the centre of Naxos Town (Chora), and just 300 meters from the beautiful beaches of Agios Georgios. Naxos Edem Studios & Apartments are located 150 metres from the well-known sandy beach of Agios Georgios. 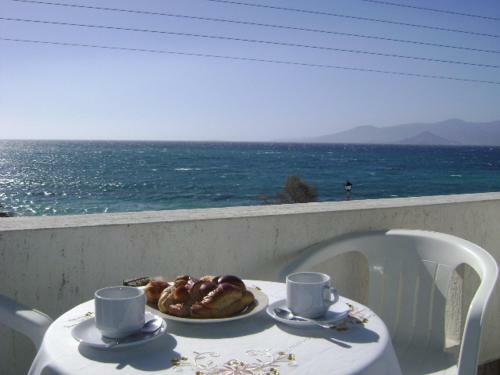 It offers self-catering studios with a balcony overlooking the Aegean Sea. Free Wi-Fi is available in the entire hotel. 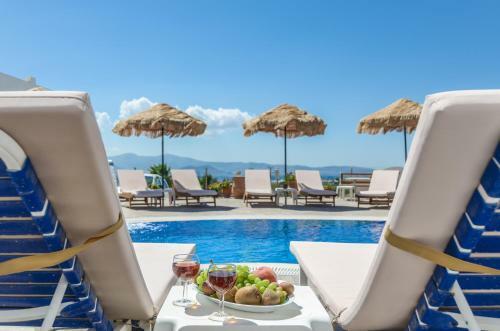 Enjoying peaceful surroundings, View to the Blue is a family-friendly resort situated just 250 metres from Agia Anna Beach and 400 metres from Plaka Beach. 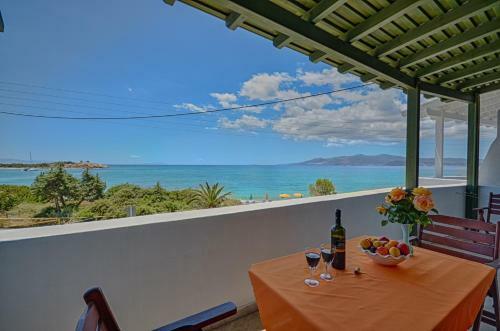 Located 150 metres from the beach, in the area of Anaxos, the family-run Anaxos Bay offers self-catering accommodation with a private furnished balcony. Within 200 metres, a bus stop connects to the villages of Petra and Molivos. 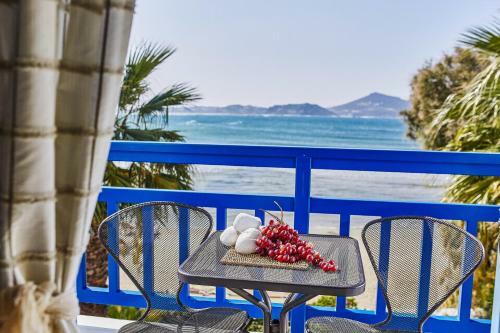 Just 100 metres from Agios Georgios Beach, Amoudares offers air-conditioned rooms with a furnished balcony overlooking the bougainvillea gardens, the Aegean Sea and Naxos Town. The hotel offers free 2-way transfer from Naxos Port (1. Just 400 metres from Agia Anna Beach, Orama Studios II offers self-catered studios with sea-view balcony and air conditioning. Parking is free, and free port transfer is provided on request. Just 25 metres from the sandy Agia Anna Beach, Maria's Residence lies within a short walk from the town's seaside cafes and tavernas. Surrounded by a well-tended garden, the property offers self-catering units with verandas. Within walking distance from the port, in the centre of Naxos Town, 300 metres from Agios Georgios Beach, Nikos Verikokos has a rooftop terrace and offers accommodation with a balcony overlooking the Aegean Sea or the garden. 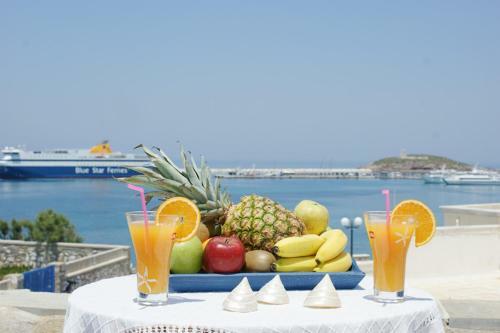 Flora Apartment & Studios is situated in Agia Anna, just 50 metres away from the sandy beach. Its air-conditioned rooms enjoy free WiFi access and have a well-equipped kitchenette. Alkion Studios, a traditional Cycladic building, is ideally situated just 150 meters away from St. George's beach, in Naxos. Free WiFi is available in all areas. 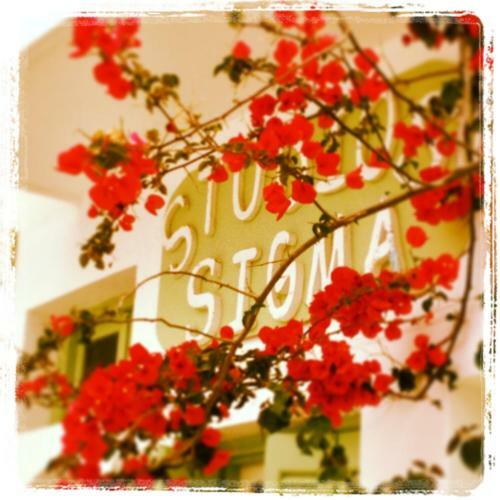 Just 100 metres from Agios Georgios Beach, Pension Stella offers free Wi-Fi. 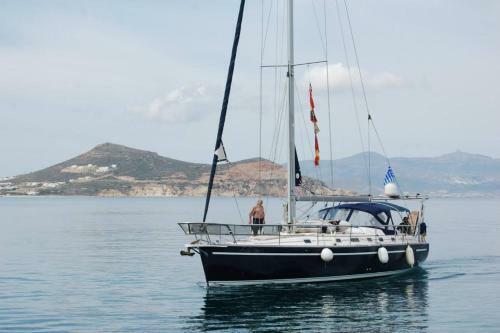 Free transfer from and to Naxos Port is offered. Rooms and apartments include air conditioning and a TV. Each kitchenette comes with a fridge and a microwave oven. 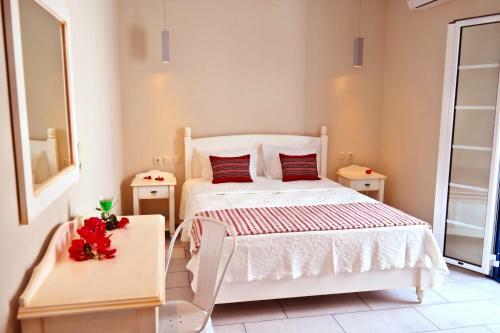 Only 20 metres from Agia Anna Beach in Naxos, Kalia Studios offers self-catered rooms with free Wi-Fi. The elegant units have a furnished balcony overlooking the Aegean Sea and the forest. Offering an outdoor pool with sun terrace, the Cycladic-style Aggeliki's Diamond is only 50 metres from Agia Anna Beach. 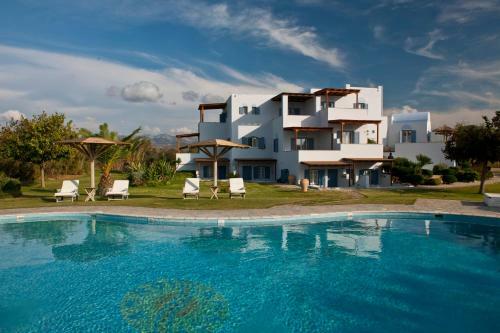 It features self-catering accommodation with views over the Aegean Sea, the garden or the pool. Facilities include a garden. 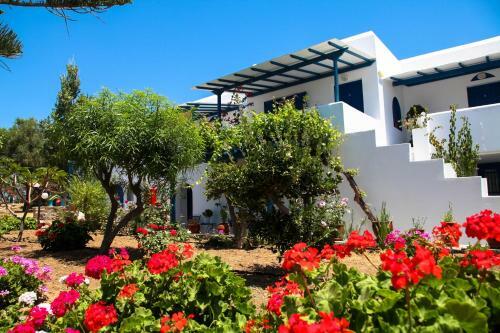 Surrounded by green gardens, Villa Danai enjoys a beautiful location in the sea-side village Agia Anna, Naxos, only 250 metres from the beach. All studios are of unique design, created by a local artist. Studios Petros are situated in a quiet area at Agios Polycarpos area of Naxos town, offering panoramic view of Naxos town and sea. Set in lovely gardens, the Summer Memories Studios offer sea-view accommodation coupled with free 2-way transfer to the port/airport on request. 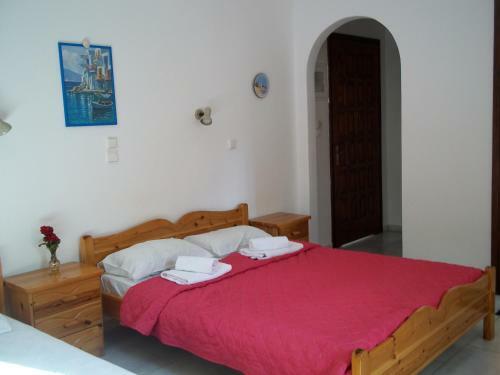 Mike's Studios enjoy a quiet location, only 100 metres from Naxos Town and 50 metres from Saint George Beach. It offers free transfer to and from the port and the airport. Free WiFi is available throughout. Surrounded by bougainvilleas Rena Valetta is 150 metres from Agios Georgios Beach and offers free 2-way transfer from Naxos Airport and port. Studios feature free Wi-Fi and a furnished balcony overlooking the garden and countryside. 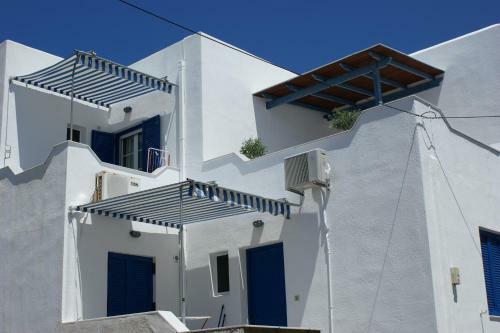 Within 500 metres of the central square of Naxos town, Studios Marina offer self-catering rooms with balcony. The sandy beach of Agios Georgios is at 400 metres. Marina air-conditioned studios and apartments are equipped with a TV. 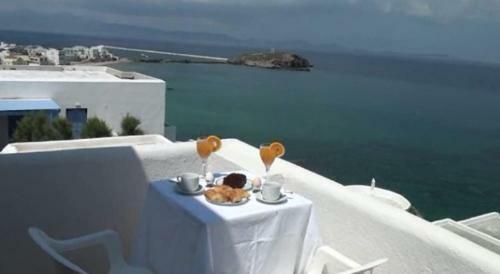 Ocean View is 100 metres from the Venetian Castle in the Old Town of Naxos. It offers free transfer from the port, a buffet breakfast and rooms with free Wi-Fi. 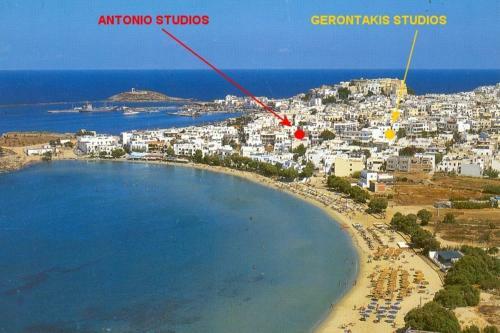 Sunny Beach Studios is situated just 50 meters from the centre of Naxos Island and beautiful beach of Agios Georgios. All studios feature fully equipped kitchenette and a private balcony or terrace, where guests can relax and soak up the sun. Sea View Studios & Apartments are excellently located in Agia Anna, just opposite the resort�s famous long stretch of sandy beach. 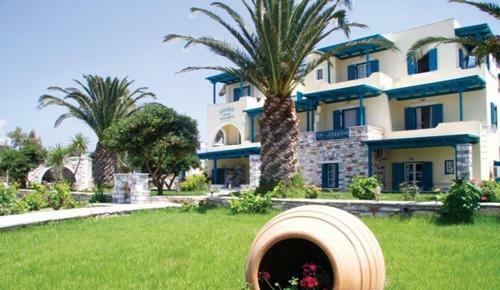 The hotel is only 6 kilometres from the town of Naxos. Rea Sun is situated in an attractive area, just 30 metres from Saint George Beach and 300 metres from the centre of Naxos Town. It features rooms with free Wi-Fi. The family-run Anaxos Gardens is just 250 metres from Anaxos Beach. Set among olive groves, palms and banana trees, the hotel features a large outdoor pool, and an all-day bar with satellite TV. Orama Apartments offers sea-view accommodation only 400 metres from Agia Anna Beach. All rooms are air-conditioned, and guests enjoy free transfer to and from the port, and free parking facilities. Located just a short stroll from the centre of Naxos town, Golden Beach offers self-catering studios with air conditioning. The port of Naxos is less than a 10-minute walk away. Golden Beach Studios are simply furnished and offer a balcony. Family-run Gerontakis Studios is located in a quiet part of Naxos Town, just 300 metres from the sandy Agios Georgios Beach and 400 metres from the centre. It offers free Wi-Fi and free 2-way transfer from Naxos Airport and port. Just 150 metres from the sandy Agios Georgios Beach, Studios Simos features self-catered studios with free Wi-Fi access. The hotel offers free transfer from and to Naxos Port. All rooms have light colours and a furnished balcony. Just 10 metres from Agios Georgios Beach and 300 metres from the centre of Naxos Town, this property features self-catered rooms. Rooms have air conditioning and a satellite TV. Each unit includes a kitchenette with a dining area and a fridge. Set in rural surroundings, 250 metres from Lagouna Beach and 1 km from Naxos town, Ammos Naxos Exclusive Apartments & Studios offers a pool and a spa centre with sauna and beauty treatments. It features self-catering accommodation with free WiFi. 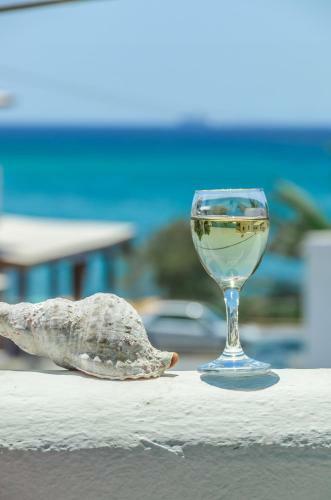 Literally steps away from the sandy beach of St George, Sigma Studios on The Beach offer well-appointed rooms, within walking distance from the centre and the port of Naxos. The studio's traditional architecture and design coupled by a high degree of comfort, creates a unique atmosphere for you to relax and enjoy yourself in the beautiful facilities of Korali Palace. 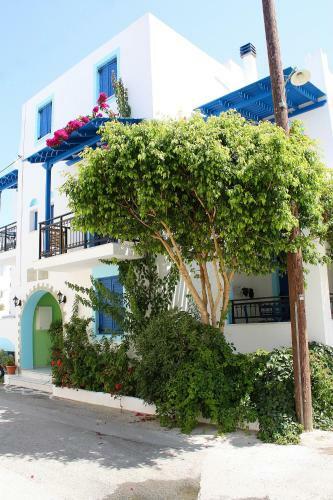 This charming, family-run complex is centrally located on the main street of Anaxos that connects the villages of Petra and Skoutaros. The beautiful sandy beach can be accessed via a small path, and the pleasant stroll takes about 10 minutes. 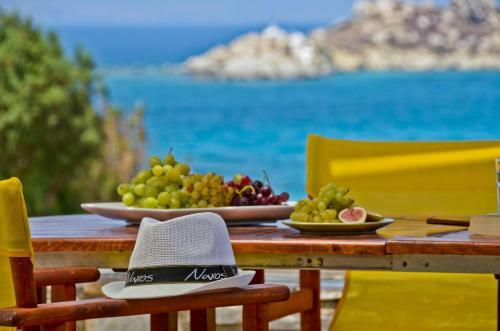 Family-run Ikaros Studios is situated 800 metres from Naxos city and just 300 metres from Agios Georgios Beach. It offers a swimming pool and self-catered, air-conditioned accommodation amidst beautiful gardens. 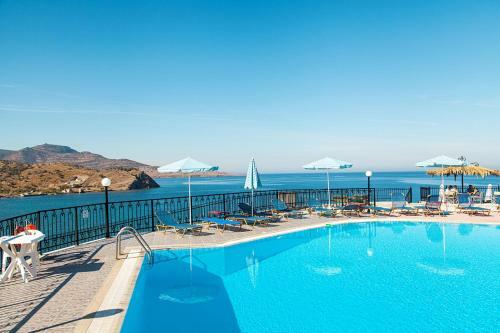 Studios Stratos are beautifully situated 50 metres from the famous and magnificent sandy beach of Saint George in Naxos Town and only 100 metres from the centre. This apartment complex is ideally situated just 200 metres from the beach and 300 metres from the town centre and provides a comfortable and functional base for your stay. 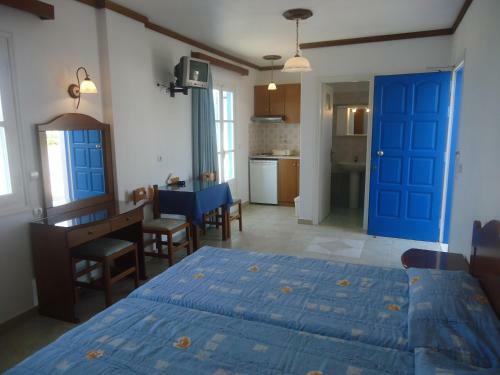 Anemos Studios is located in Agia Anna within 20 metres from the sandy beach. It offers self-catering accommodation with free WiFi and furnished balconies. 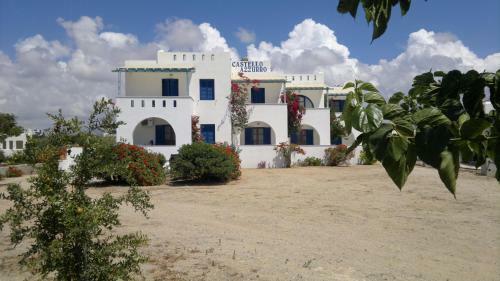 Castello Azzurro is a self-catering accommodation located in Agia Anna village of Naxos Island. 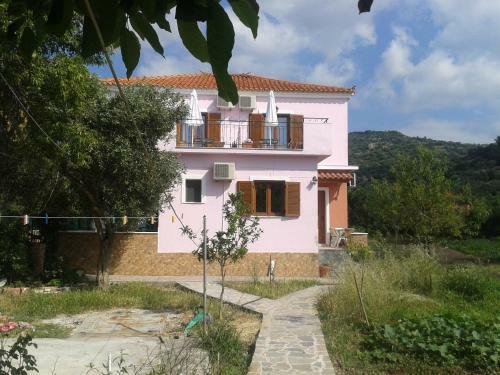 The property is 500 metres from Agia Anna Beach. Y/S Sofia Star 1 is moored in Naxos Port. A private chef cooking breakfast, lunch and dinner can be arranged. The accommodation will provide you with a flat-screen TV and air conditioning. There is a full kitchen with a microwave and an oven. 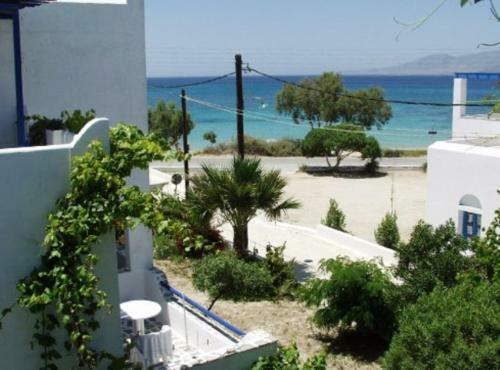 Holiday Home Naxos - 06 is a holiday home set in Agiassos, 200 metres from Agiassos Beach. It provides free private parking. Free WiFi is offered throughout the property. 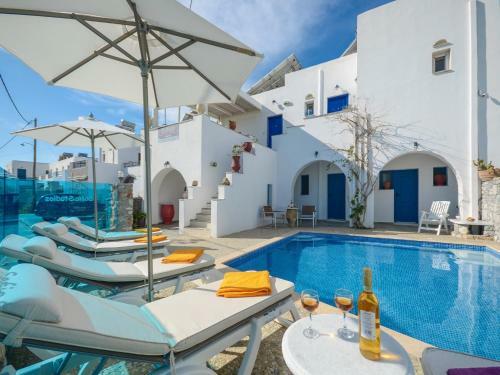 Just 40 metres from Agia Anna Beach in Naxos, the whitewashed Pension Elena offers air-conditioned studios with free WiFi and furnished balcony. Shops and restaurants are within a 3-minute walk. Studios at the Pension Elena feature a TV. 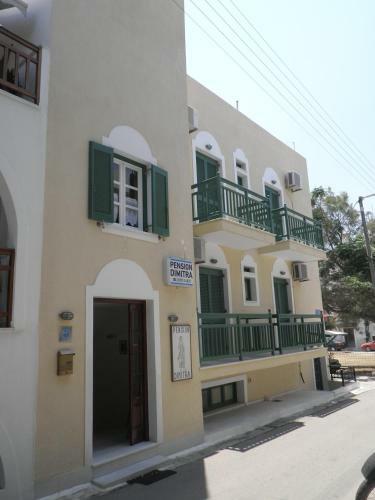 Kallisti Studios is located 100 metres from the centre of Naxos Chora and offers self-catering accommodation. Free WiFi access is available. The property is 700 metres from Naxos Castle and 1.2 km from Portara. 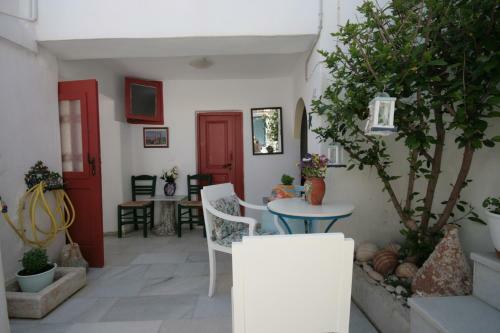 Featuring a garden and free WiFi, Amfitriti's Apartment is located in Naxos. 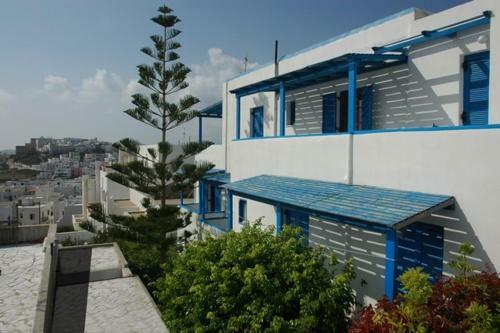 It offers air-conditioned apartments with a balcony and patio overlooking the sea. The beach is 500 metres away. Each apartment includes iron beds and marble floors. Located in Glinado Village, Villa Bella Vista is set amidst a garden with trees and vines. It offers fully equipped and tastefully decorated accommodation with garden, mountain and panoramic Aegean Sea views. Free WiFi is available throughout. Featuring a sun terrace and free WiFi, beachfront Thomais House is located in Grotta area, in front of Portara in Naxos Island. It is 1 km from the port and the centre with shops and cafeterias. 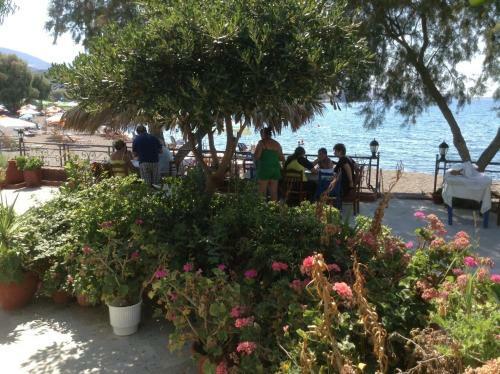 Located in Agia Anna Beach, the seafront Elli Studios offer a restaurant. They feature self-catering accommodation with a balcony and free WiFi access. 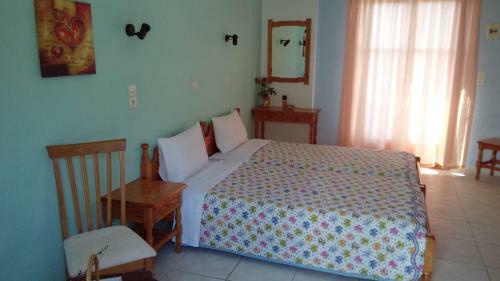 Several restaurants, caf� bars and a mini market are 20 metres away. Located in Naxos, within 400 metres of Agios Georgios Beach, Archaion Kallos features an outdoor pool and a tennis court. It includes a 4,000-m� garden with outdoor furniture, private chapel, terrace and free WiFi. Ippokampos is a beachfront property located in the main town of Naxos and offering rooms with direct sea views and free Wi-Fi. It features an a la carte restaurant and a seaside bar. 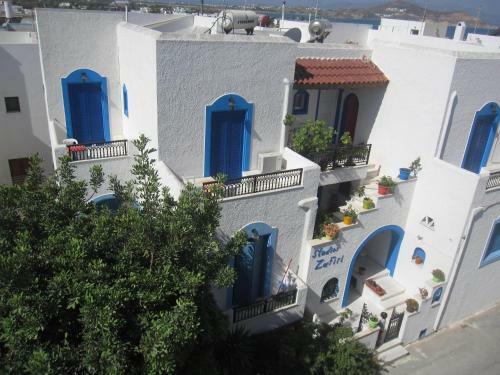 Studios Zafiri is located in Naxos Chora and offers self-catering accommodation. Free WiFi access is available. 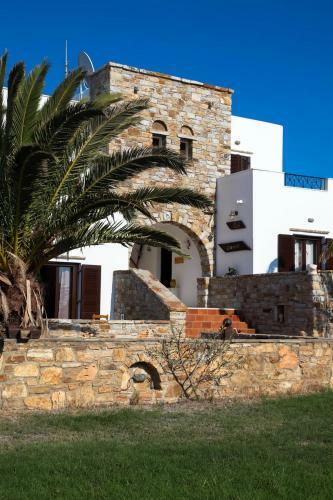 The property is 800 metres from Naxos Castle and 1.4 km from Portara. 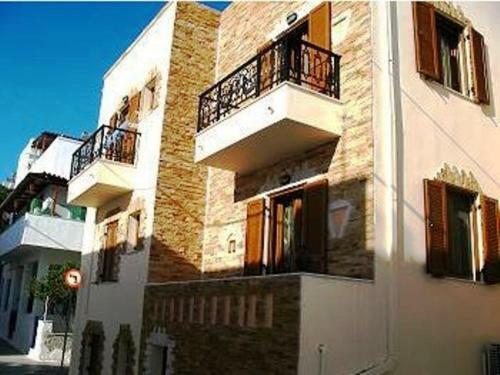 Irini Apartments Anaxos is situated in Anaxos, 2.9 km from Petra. Free WiFi is available throughout the property and free private parking is available on site. The rooms come with a flat-screen TV. 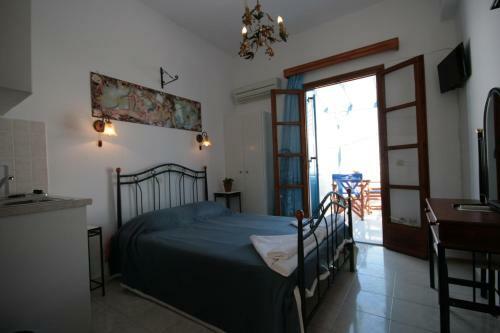 Studios Gabriel is a self-catering accommodation located in Agia Anna Naxos. Free WiFi access is available. 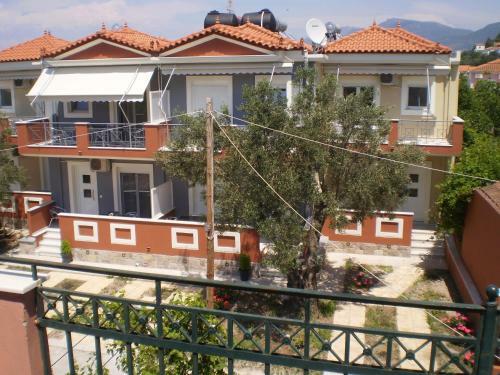 The property is 30 metres from Agia Anna Beach. The apartment will provide you with a TV and air conditioning. Just 30 metres from Mikri Vigla Beach, Ydreos Studios & Apartments are traditionally built in Cycladic style. They offer self-catered accommodation with a view to the Aegean Sea. Free Wi-Fi is available in all areas. 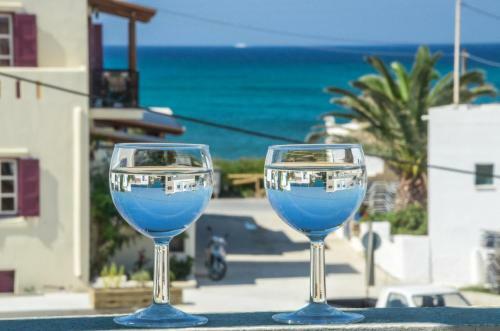 Just 120 metres from the Blue Flag beach of Agios Georgios and 150 metres from the centre of Naxos Town, Elia offers air-conditioned studios with free Wi-Fi and a balcony or terrace. Only 150 metres from the rocky Grotta Beach and 800 metres from Agios Georgios Beach, the Cycladic-style Iliada Studios is a 3-minute walk from central Naxos Town. Located just 60 metres from the sandy beach of Agia Anna, Sunday offers self-catering accommodation with Aegean Sea views. The main town and port of Naxos are 5 km away. All the air-conditioned studios and apartments open out to a furnished balcony. 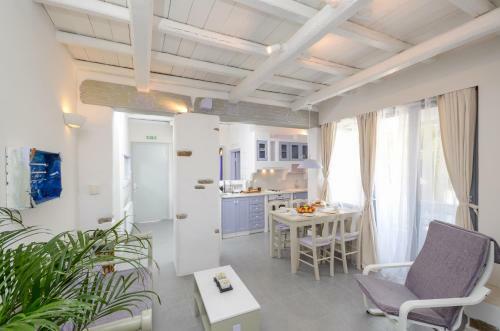 Located 20 metres from Agia Anna Beach, Villa Christine offers free Wi-Fi in public areas. Its air-conditioned rooms come with kitchenette with fridge. 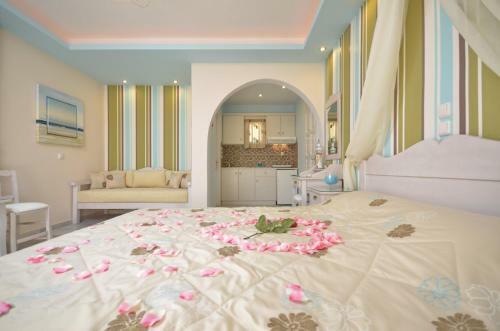 Rooms at the Villa Christine are decorated in a classic, modern style. Cycladic View offers fully equipped sea-view studios. It stands just 350 metres from the lovely beach of Agia Anna, and 6 km from the port and the town of Naxos. 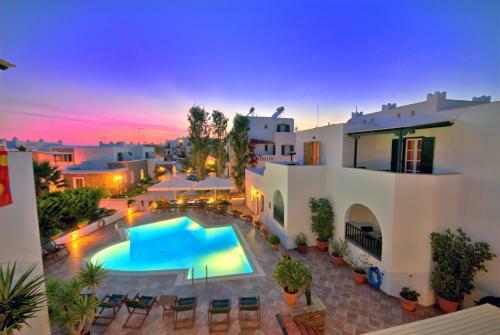 Cycladic View is a complex of spacious, self-catering studios with balconies. Situated just 20 metres from the sandy beach of Agios Georgios, Sofos Studios offers self-catering units with complimentary breakfast. The centre of Naxos town is within 100 metres from the hotel. Thomais Studios is located on the popular Saint George Beach. All studios have balconies, some of which overlook the sea. Guests are greeted with welcome gifts, including cake and fruit. 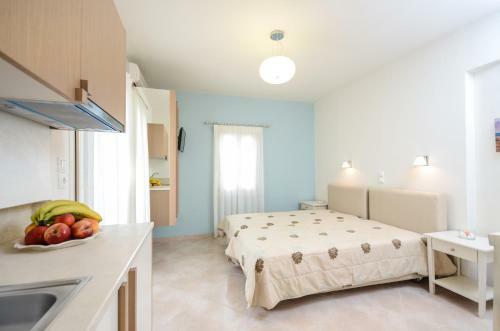 Situated 80 metres from the sandy beach of Agia Anna, Maroussa offers well-equipped studios built within a lovely flower garden. Both Wi-Fi and wired Internet access are available free of charge. 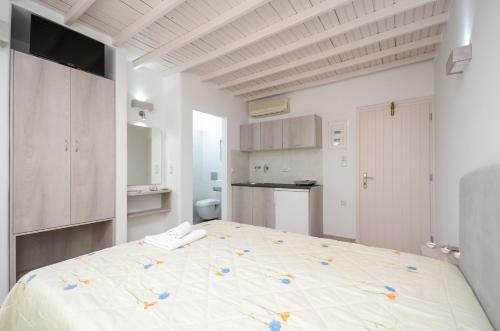 Within just a 5-minute walk from Naxos town centre, Katerina Roza features self-catered studios with a furnished balcony. It offers free Wi-Fi throughout the complex and free private on-site parking. Anaxos Hill Village offers rooms with views over the bay of Molyvos. The beach is reached after a 50-metre pathway, while a freshwater pool with panoramic sun-lounger terrace and free Wi-Fi is featured. Santa Katerina Studios & Apartments offers a terrace with panoramic view. The traditional hotel features air-conditioned rooms with 2 furnished balconies and free WiFi. Saint Vlassis is situated in a quiet and peaceful area, only 700 metres from the centre of Naxos Town and 400 metres from the sandy beach of Agios Georgios. It features a restaurant serving local cuisine and hosting events. 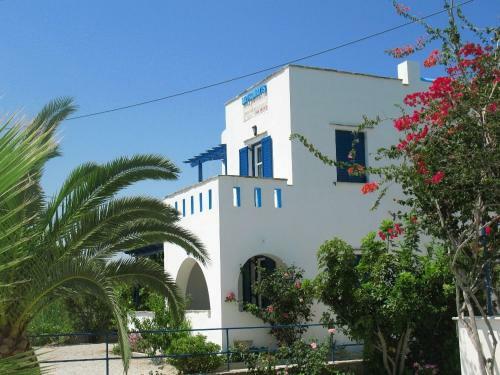 Argo Hotel is a small family-run hotel situated in a quiet area of Naxos Town, only 100 metres away from the beach. A multilingual reception, free internet corner and swimming pool are available. Set right on the sandy beach of Agios Georgios, Kalergis Studios is surrounded by colourful gardens. It offers tasteful accommodation with a well-equipped kitchenette and dining area. Free Wi-Fi is available throughout. Situated 70 metres from Agios Georgios Beach in Naxos Town, just 200 metres from the centre, Alpha Studios offer free Wi-Fi. 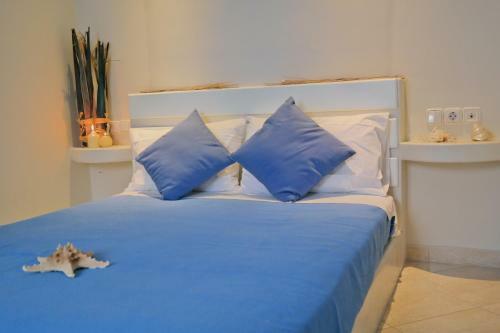 The self-catered studios are air-conditioned and have a furnished balcony or patio area. 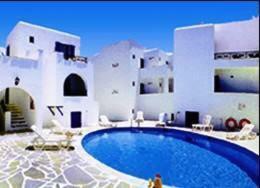 Adriani Hotel is located in Grotta, one of the most beautiful areas in Naxos Chora, just 500 metres from the port. It features tastefully decorated rooms with free WiFi. Conveniently located near the centre of Naxos Town and the beach of St George, Pension Irene II offers a range of studio accommodation and apartments in Cycladic style. Enjoying a prime location just a short walk away from Saint George Beach and the lively Naxos Town, Spiros Hotel offers accommodating rooms in Naxos. Taki's Place is situated in the centre of Naxos Town, just 200 metres from the well-known beach of St. George. Guests enjoy a lovely courtyard and free port/airport transfer. Free WiFi is available in all areas. Built in 1566, Venetiko Apartments are located in the heart of Naxos Old Town, right next to the medieval Venetian Castle. Findings of Naxos Ancient Town are exhibited in the units. Featuring a sun terrace and free WiFi, beachfront Naxian Althea is located in Agia Anna in Naxos. It includes a balcony overlooking the Aegean Sea. The air-conditioned house has a flat-screen TV and kitchenette with electric kettle.